Camellia Ruby Jewel of the Month was formerly owned by Lady Lily Safra. Lady Safra was a bright yellow flower herself ("Safra" is an Arabic word, and translated into English means "something yellow") who was married to Edmond J. Safra (Arabic: ادموند يعقوب صفرا‎; August 6, 1932 – December 3, 1999) a Lebanese-Brazilian Jewish banker. 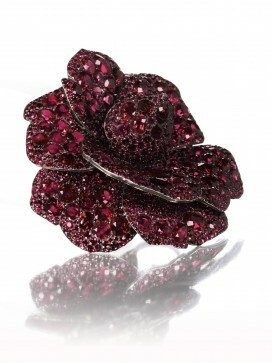 The Camellia Ruby Jewel was part of a collection of the Jewels of Hope: the Collection of Lily Safra. Auctioned by Christie's in May 2012, proceeds exceeded all pre-sales estimates. Lily Safra herself also added to their value, as she was so dedicated to art and jewelry. The Camellia flower was named after Joseph Kamel 1661 - 1706, a Moravian Jesuit who described botany of the island of Luzon in the Philippines. A flowering evergreen of the tea family, the Camellia flower is a native of China and Japan. The symmetrical beauty of the Camellia and it's long lasting quality have been appreciated by young lovers as a token for expressing love for each other. In Chinese flower meanings, the petals reflect the spirit of a lady and the holder of the petals ( the calyx) represents, the male as protector of the petals. The Camellia is highly respected in Southwest China and is the national flower of the ancient southern kingdom of Dai Li. This land is marked by steep hills and raging rapids and the hills and valleys of the kingdom are transformed into a sea of ruby red and white in early spring. The Camellia Ruby Jewel Broach, is the curtain raiser for July Jewel of the Month. The birthstone for July is the Ruby. The broach was among 18 pieces by Joel Arthur Rosenthal JAR. As the Camellia Ruby Jewel demonstrates, JAR chooses exceptional gemstones and works around them to create works of art. Auctioned at Christie's in Geneva on May the 14th, the sale was the largest single owner selection of pieces by JAR. Felice Leiftinck, jewelry specialist at Christie's said the appeal was in the fact that JAR "is as much an artist as a jeweller and his pieces are colorful, eccentric, completely different from normal jewelry." Looking at Camellia in Ruby Jewel, naturalized in this expressive three-dimensional piece, sharing similarities of form with the Brazilian green quartz Trumpet Flower and 1st place Gemmy's winner in 2011, one would have to agree with Felice Leiftinck. November Jewel-of-the-Month: Art Nouveau Whitby Jet Bracelet SOLD! December Jewel-of-the-Month: French Georgian Sapphire Earrings SOLD! December Jewel-of-the-Month-2: Platinum Diamond and Sapphire Ring SOLD! January Jewel-of-the-Month: 18KT French Diamond & Emerald Ring SOLD! February Jewel-of-the-Month: 15KT Victorian Bohemian Garnet Ring SOLD! March Jewel-of-the-Month: 18KT Victorian Aquamarine Engagement Ring SOLD! April Jewel-of-the-Month: 18KT Art Nouveau Platinum Antique Engagement Ring SOLD! May Jewel-of-the-Month: Persian Gulf Natural Pearl Necklace SOLD! September Jewel-of-the-Month: 1920s Platinum Vintage Brooch Loaded with 7.30 crt Brilliants! August Jewel of the Month 2010 | Circular Jade Pendant - Famous Treasure! September Jewel of the Month 2010 | Treasure of Vergina - Famous Treasure! Christie's Auction - 27th October 2010 - SOLD! Sotheby's Auction - 30th November 2010 - SOLD! Sotheby's Auction - 9th December 2010 - SOLD! April Jewel of the Month 2011| Art Deco Diamond Ring - SOLD!